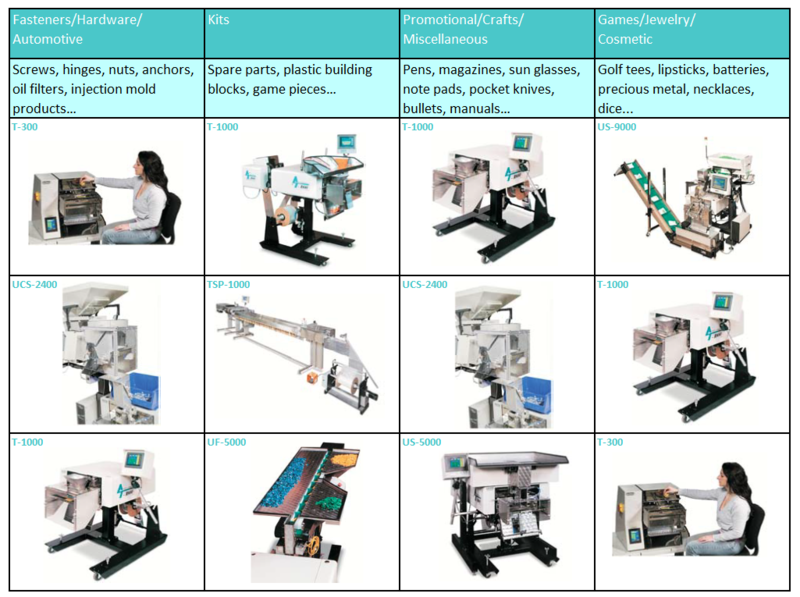 APPI can provide packaging solutions for any industry. If you need guidance, our expert salesmen can guide you toward the perfect system. Their dedication leads them to visit facilities, analyze your space, evaluate your product, and come up with the perfect solution for you! However, we want to be able to help guide you in the right direction from the table below. 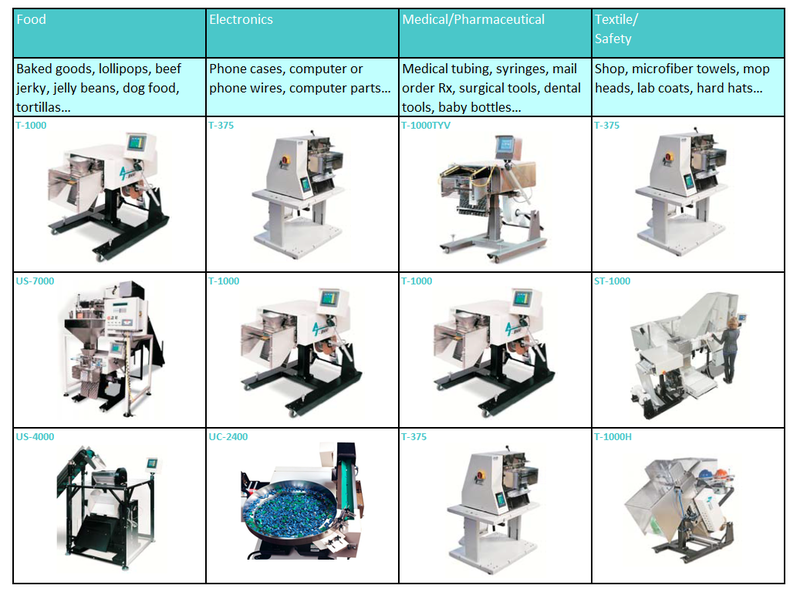 Here are a few examples of bagging machines that are often used for some general product categories. The list is not comprehensive! Tell us about your application product. Click on the "Watch Now" icon to see a video about Advanced Poly's Industry Solutions"
This system is a perfect industry solution for counting parts (no weighing) such as fasteners, electrical components, small molded parts, and crafts items. Advanced Poly will evaluate your products by running them through our parts counters to confirm speed, accuracy, bag specification and system specifications. With this valuable information, you can decide whether this is a good solution for your company. Advanced Poly’s newest industry solution focuses on the ever-increasing Ecommerce demand. As companies specializing in online sales grow larger and larger the need for a streamlined yet simple solution is obvious. Our Ecommerce Fulfillment System combines the practicality and efficiency any fulfillment application requires. Pairing our T-1000 bagger along with our customizable infeed system we have created the perfect system to accommodate your fulfillment needs. Banking System with CD-20 Automatic Cash Dispenser. Automatically feeds wrapped stacks of US Currency into the T-1000 Advanced Poly Bagger. 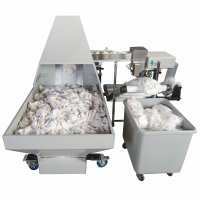 UC-2400 "Kit" Parts Counting System, Complete w/ UF-5000 "Kit" Conveyor, T-1000-S14 Advanced Poly-Bagger, Ti-1000Z Inline Thermal Printer and UF-2000 Takeaway Conveyor. This system is a perfect industry solution for creating "kits" of parts by counting each individual part number in a parts counter, with up to eight (or more) parts counters on the system. Our UC-2400 parts counters are a perfect for counting fasteners, electrical components, small molded parts, and crafts items. Advanced Poly will evaluate your products by running them through our parts counters to confirm speed, accuracy, bag specification and system specifications. With this valuable information, you can decide whether this is a good solution for your company. This system is a perfect industry solution for counting parts (no weighing) such as fasteners, electrical components, small molded parts, and crafts items. Although the system can be configured with various options, the system is “pre-engineered” so minor changes such as adding scanners or stack lights will only “tweak” the system to meet your requirements. Also, the system can be further engineered with a check-weigh scale (model US-4000) to perfect the system. This system is a perfect industry solution for counting parts (no weighing) such as fasteners, electrical components, small molded parts and crafts items. Although the system can be configured with various options, the system is “pre-engineered” so minor changes such as adding scanners or stack lights will only “tweak” the system to meet your requirements. Also, the system can be further engineered with a check-weigh scale (model US-4000) to perfect the system.